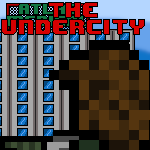 Welcome to the UnderCity, an interactive comic where You, the reader decides the character's action. Each action is determined by majority consensus, and may change the story considerably as you go. Inspired by Morgenstern's comic "Blood is Mine." I'm a soldier, and I make comics. That's just how it is. Had no connection for the longest time. What kind of sensors must ALCAM have to be able to measure a temporal anomaly? Also, author, where'd you go? I also second plan "ahead cautiously." Whatever is on the other side of that wall is definately dangerous, and we are horribly unprepared; we don't have weapons, information, safety nets, allies or a plan; but, we are already notoriously good at improvising, as well as confident, capable, cybernetically enhanced and a little lucky, so we've got this. So almost 3 minutes slower? If we look do we see ourselves approaching? Demand Alcam mute the errors. Single notification on these errors going forward please. We want the offset at a useful interval or when it changes sharply. Move slowly a step or two closer to the anomaly and get a new reading. If we can go back far enough can we rescue ourselves? Maybe we should walk away for a short moment just so we can ask ALCAM what is happening, as he is obviously broken by something right now.